Is Saddam Husein alive? The astrological report. The special, Exclusive Report prepared by the Astrologers of Aryabhatt. About the possible outcomes of the war. These Different, Reports are prepared by the Astrologers of Aryabhatt. About the possible outcomes of the war and what will happen with Husein in future. 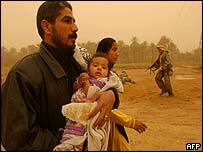 The war between IRAQ and USA was started on Thursday 29th March 2003 at 5:34(I.R.T. ), When USA attacked on IRAQ by firing 40 Cruise-Missile. Although there was already tensed-environment between USA and IRAQ from the previous Gulf-War (1991). But most of the countries are againest this war. Mr. George W Bush is born under Cancer ascendant. Lord of ascendant the Moon is creating the GAJ-KESARI YOGA with Jupiter in third house, which is giving him authority, enough profit of money, prosperity and self-confidence. In the horoscope of President of Iraq, Mr. Saddam Hussein, the Cancer ascendant is rising at 21�. Its Lord Moon is situated in his debilitated sign Scorpio in the fifth house with Mars and Rahu.